When: Saturday, June 2 at 7:30 p.m.
Another massive road test against one of MLS’ best teams awaits the surging Philadelphia Union on Saturday night against Atlanta United at the always-raucous Mercedes-Benz Stadium. 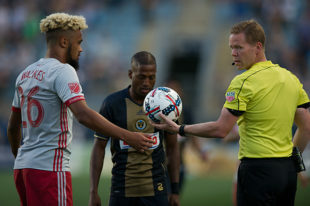 After a tremendous performance a week ago on the road against New York Red Bulls and a confident mid-week victory over the bunkering Chicago Fire, suddenly surging Philadelphia will have to pull off the truly spectacular to earn even a point against Atlanta. Jim Curtin’s squad, though, looks posed to make some noise in the Eastern Conference before the World Cup break. Saturday’s matchup will be a fiery test of their ability to compete against one of the top teams in MLS. Maybe we’ll finally have our answer to Curtin’s quip whether the Union really are a good team. Atlanta United’s attack is probably the most feared in MLS and with good reason. The fearsome frontline of Josef Martinez, Ezekiel Barco, and Miguel Almiron is going to test the Union’s young defense more than any other team this season. In their mid-week matchup at New England, Atlanta experienced their own xG implosion and missed about ten breakaways before giving up a (admittedly soft) penalty for a 1-1 draw. They’ll be looking to get those chances in the back of the net against a very stodgy Philly defense. On defense, though, Atlanta is leaky and will be without starting centerback Leandro Gonzalo Pirez. 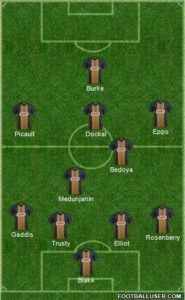 Atlanta likes to play without the ball so they can break quickly after turnovers, so it will be on the Union’s central midfield to play intelligently and make the most out of goal-scoring opportunities. What’s that you hear? Why, my friends, it’s the sound of squad rotation! Yes, expect Jim Curtin to field Fafa Picault and Marcus Epps on the wings after their mid-week rests, along with Jack Elliot on the backline for the banged-up Mark McKenzie (isn’t it nice to have like-for-like depth?!). For the first time in a long time, we’ll see if some fresh legs help an important road effort against the Supporter’s Shield frontrunners. The goals are finally starting to go in for Philadelphia, and they’re going to need them in Atlanta. Look for Curtin to push his wingers behind Atlanta’s wingbacks to exploit the space the Five Stripes’ 3-5-2 formation. Philly’s central midfield trio needs to be absolutely prudent with the ball to avoid the kind of turnovers that Miguel Almiron feasts on. Most of all, Saturday’s match will be all about Philadelphia’s defense. Is it for real? Atlanta will score, no doubt, but it will be on the young backline to mitigate those chances and keep the game close enough for the Union to steal some points on the road. The Union are going to need some goals if they want any chance of earning a result from this match. It will again be on Dockal, who is in fine form and truly finding himself in MLS, to be the fulcrum of the attack. Larentowicz, for his part, is the backbone of Atlanta, putting in the dirty work to let all the attacking talent in the lineup to party up the field. Dockal will have to play smart and hard to find areas to work and create chances for the Union. Trusty has been spectacular this season – better than anyone could have imagined – but can he do it against world-class attackers? We’re about to find out. Trusty hasn’t just played great, he’s absolutely been the defensive leader for this team. Atlanta’s attackers aren’t prolific just because of their skill – they are so, so good at finding just the tiniest bit of space they need and exploiting it for bonkers goals. Trusty’s challenge won’t just be laying in big tackles, but organizing his comrades in the back and cutting off those spaces for the Five Stripes’ front line. I think the Union will give Atlanta United a run for their money, but they just don’t have the firepower on the road to keep up with Atlanta. Oh good… an angry Atlanta team at home. If they U walk away with a point (or somehow, more) I will truly think they’ve turned the corner. We shall see. Given how McKenzie and Trusty shut down NJPC last week, I would feel a lot more confident if McKenzie is healthy enough to go rather than relying on Elliot. Yes. If they play well and lose on a Martinez golazo, then fine — a superstar beat us in front of a packed crowd at home and that’s OK. Or if they lose on a crappy call or some other such bad luck, whatever. It happens. But they need to show well to keep their confidence. Curtain recently talked about using McKenzie in some situations and Elliot in others. I feel like this would be a McKenzie game, but it’s not worth losing him to a worse injury for longer if it means we give up points in this game. I saw someone on these comment pages remark recently that the Union have come this far, clawing their way back to a .500 record, without having Andre Blake really steal any points so far this year. Well, this may be where we need our Jamaican Superman. I think the predicted 3-2 scoreline could be right on the money… unless Blake is faster than a speeding bullet. In which case he just might hold it to 2-2 and earn us a point.